Aren ‘t Jessie and I fortunate? We are not living in a mud hut with dirt floors. Actually I had a picture of a tree that had been hacked down and lovely green sprouts were at least 14 inches high emerging straight out of the shorn tree stump and one wondered HOW? No rain, only the will to survive as seems to be the way with life. While in The Holy Land a few years ago I saw colorful wildflowers growing out of desert sands and rock solid earth in other places. When I saw the tree the other day I thought: Resurrection, new life, but the computer gods over here are in control and I cannot get it on the blog. However, the old rag mop is also a bit of some kind of resurrection. When have you ever seen anything like this? 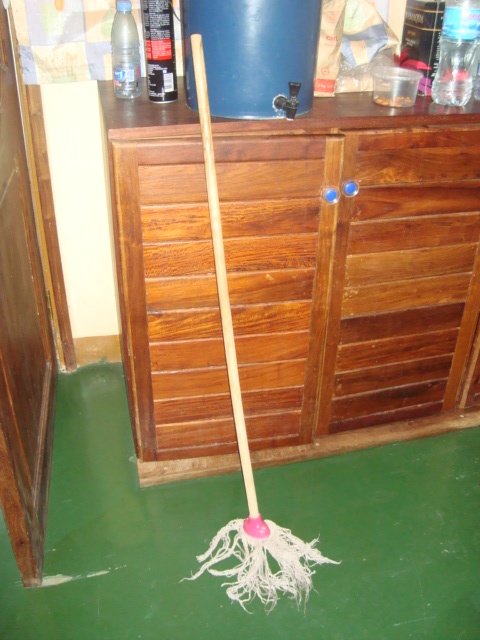 I had just mopped the kitchen floor with this mop minus a few strands. It reminded me of Carol Burnett in her role as the maid ~ of course I don’t remember the character’s name. The longer we are here the easier it becomes to refocus our lives from abundance to scarcity. We save everything including the cardboard roll that the toilet tissue is on. It’s rock solid and the paper is so thin that is shreds like wrapping tissue. The art teachers use them. Someone came by a little while ago and wanted to pick a lemon from our tree. We didn’t KNOW we had a lemon tree mainly because all the lower branches had been picked clean the the little lemons were way up high and looked like baby limes. Oh, Lord, for a vodka tonic. We both had a full day of classes today ~ Jessie at Bp.Stanway and I at the college. Sometimes I think they are more interested in the funny things in my ears (hearing aids) than their subject on call and spirituality. It’s a strange place for me to be ~ I mean spiritually.